Hand washing is an integral part of keeping kids (and their parents) healthy. We are a busy household, and I'm surprised at times to learn about the things that my sons have been touching. They pick up rocks from the yard, but they'll also touch a toad, drag around dog toys, and climb inside the chicken coop to look for eggs. All activities leave their hands dingy and a little bit stinky, too! I'm not a germaphobe. I understand that there is no such things as a perfect clean. But dirty hands don't belong in mouths or at the table. That's why we have stressed hand washing. It doesn't take long at all to take hands that are questionable to hands that are adorable! If you kids can't reach the sink, they will not wash their hands. If they need help every time, they will not wash their hands. Consider installing a touch-free faucet in the bathroom, if handles are an issue for your kids. Put hand soap where they can reach it. Give them a step stool and their own hand towel rack that is easy to reach. 2. Give them a song. Do you know how long kid are supposed to scrub up? It's probably not as long as you think, and yet most of us don't do it long enough. Sing the ABC's and you'll have washed for the right amount of time. Extra points if it teaches your youngest ones to read early! 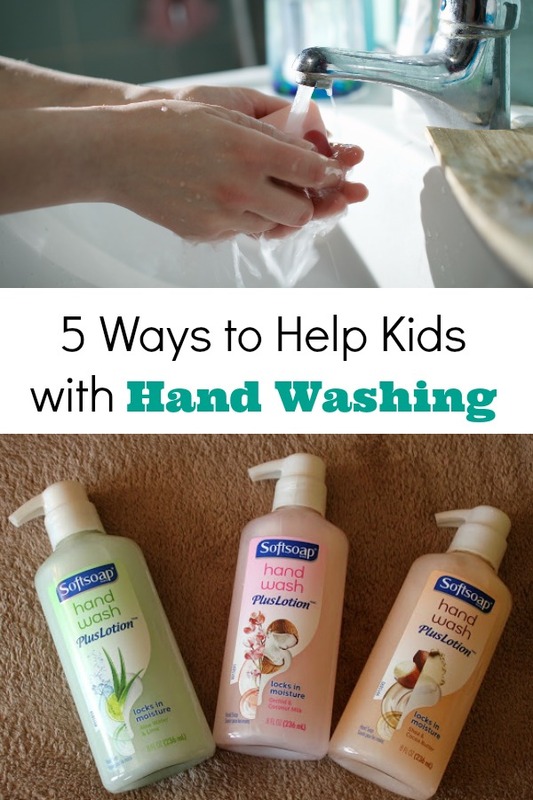 It can be hard for kids to know when they should wash. Without being a freak about it, there are some appropriate times to have very clean hands. These include before eating, preparing food, or being around a new baby. Hands should also be washed when there is visible dirt on them or when they've touched something icky. At our house, this means any time is a good time to wash hands. 4. Do double-duty during cold and flu season. Did you know that the act of washing hands is one of the single most effective ways to keep the cold and flu from being passed around? It's certainly more practical than hiding in your home all flu season, and it's something we can do without causing much stress or uncertainty for our little ones. Getting kids and adults to wash hands might seem difficult at first. If you're not a hand-washing family, it can seem like an interruption to daily life. We make it fun by having some products in the bathroom that smell good and look pretty. The new line of SoftSoap Hand Wash Plus Lotion* is perfect for parents and kids. The product smells amazing, with varieties like Orchid & Coconut Milk, Shea & Coco Butter, and Aloe Water & Lime. The extra touch of lotion leaves hands feeling soft and pampered -- even in the harsh winter weather! Starting early is still the best way to build healthy habits. But it's never too late to start a healthy hand washing routine! *Samples of SoftSoap Hand Wash Plus Lotion were received to review. Opinions are our own.